Extraordinary creativity and experimentation in the field of marble processing, Kreoo is an Italian company that realizes furniture and accessories with high design level for architecture, interiors and outdoors. The design of the collections is by the Venetian designer Enzo Berti, whose enhances the skills’s expression of the material, creating objects that possess a soul: strong objects, in some way “traditional”, that induce, almost inadvertently, to an improvement in the ability to seeing things. 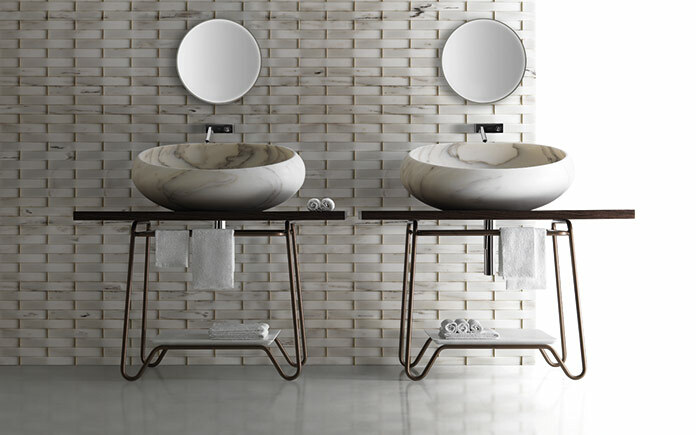 The company already offers a wide collection, flexible systems declined in high seduction pieces that, in some cases, have become icons of the brand, such as Gong washbasin, Pavè Stone seats or Arcaico table. At Salone del Mobile 2016, the Bowl n.1 of Kreoo Nabhi Collection, introduced with great success in 2010 and characterized by a sinuous and wavy shape that opens up like a flower’s corolla, is now presented for the first time in blue. 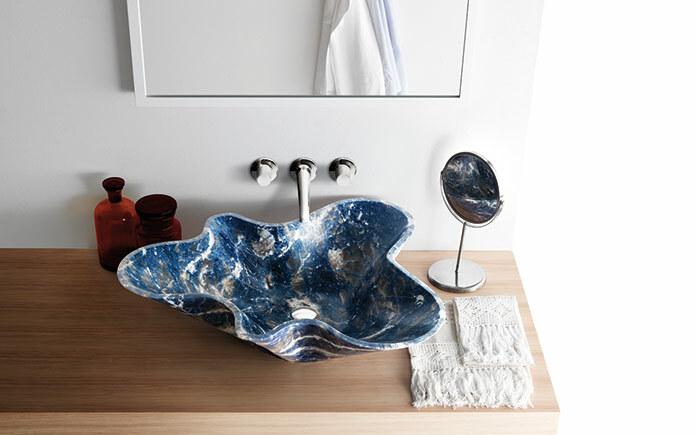 Intense, deep, intriguing: Blue Sodalite, with its small intrusions of black and white veins, has a sophisticated allure and mysterious elegance that emphasizes the sweet harmony and beauty of the sink. 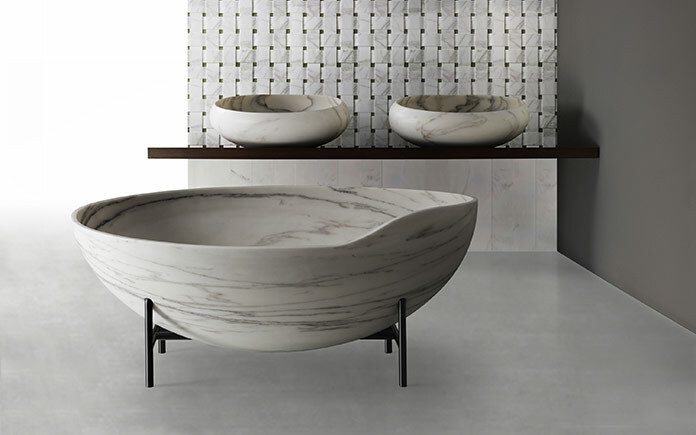 This marble bowl is defined by the balance of its proportions, by its dynamic lightness that’s given by the craftsman capacity of creating extremely thin thicknesses and graceful curves, making it an unique design object. 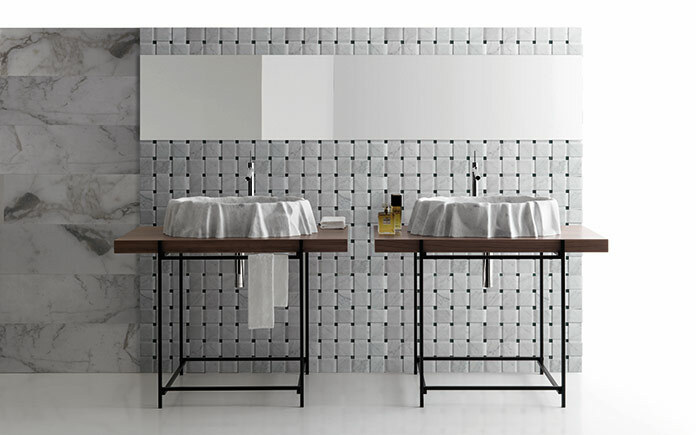 The new Kato and Hashi easels are now part of Kreoo accessories, designed as complements to washbasins collections. However, they can also be autonomous furnishing solutions, to provide comprehensive and coordinated layouts, suitable for spaces of our everyday life. Both terms are inspired by Japanese language, a formal and literal tribute to the clean typical tradition of Japanese culture and architecture. 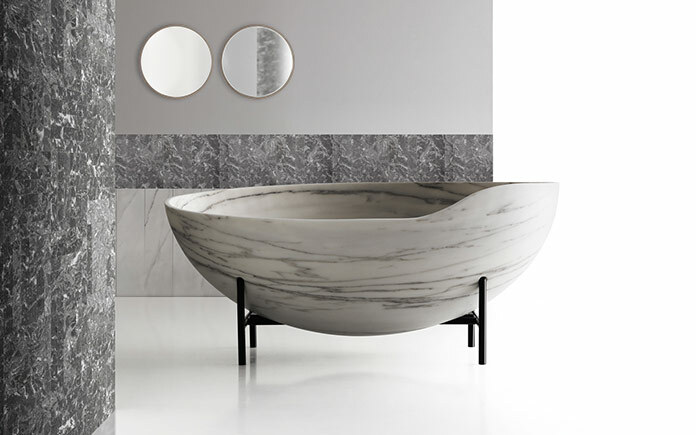 After the success of Gong washbasin presentation at Salone del Mobile 2014 and on the occasion of this event edition 2016, Kreoo presents Kora, an elegant ellipsoidal marble bathtub, that gives consistency and elegance to the bathroom environment, evoking the ancient Tibetan bells. Born as a complement to Gong sinks, Kora takes its name also from a traditional musical instrument of West Africa, characterized by an elliptical shape. As in Gong, Kora is cut from one single solid block, carved with a meticulous and fine technique, achieved by digging the stone, firstly with specialized technology and then handcrafted for details and finishes. The tub rests on an iron tripod that supports its volume, giving stability and elegance. On the occasion of Salone del Mobile 2016, Kreoo introduced a new sink among all the items of its vast collection: Nami. 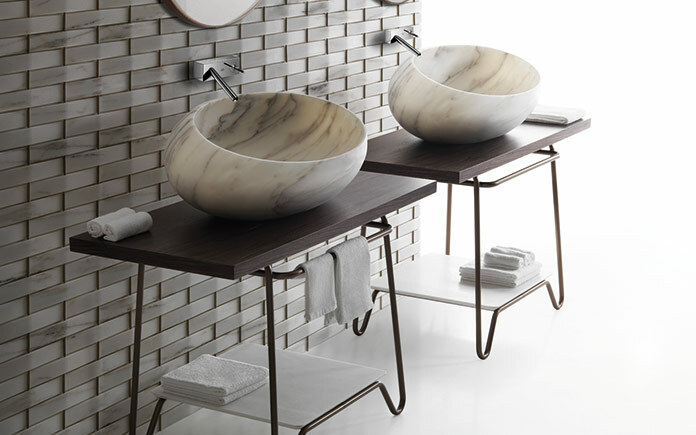 Nami means “wave” in Japanese and it is an oval washbasin, whose sinuosity is reminiscent of a cloth’s drapery: marble is manipulated with sculptural skills, creating soft waves on its outer side. The reference comes from the Italian figurative Art History, and more specifically from the monumental drapery of Michelangelo’s Pietà, Virgin’s dress. In the game of lights and shadows, marble is presented as a light, sophisticated and precious material. 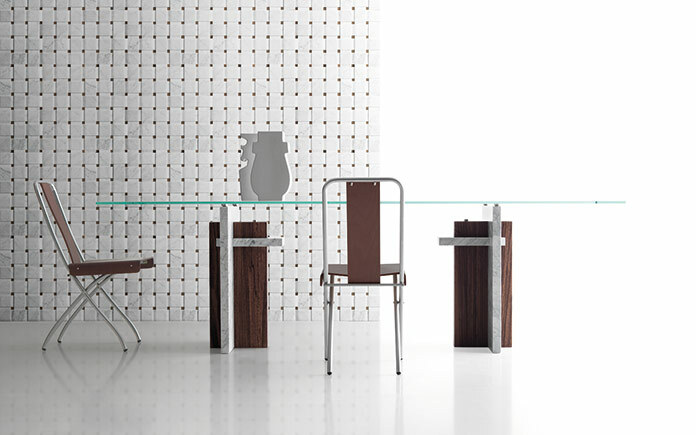 Unique, because even if Nami is born from an industrial process, is then modeled by skilled masters craftsmen who, paying tribute to the Italian ancient sculptural tradition, give the product the plus value of being unrepeatable. At Salone del Mobile 2016, Kreoo also introduced two new proposals for wall coverings. The fil-rouge between Texo and Panama is the action of braiding the stone, flexibility and malleability of marble that creates new architectural solutions, free from the static nature of the walls. While in Texo, the interlace effect is strong, in Panama it’s softer, as light wavy movement: marble acquires its own volume and relates it to the surrounding space, creating an effect of depth and dynamism, in a three-dimensional shape. Such as a fabric weave, in Panama and Texo marble is intertwined to itself, or to other materials, recalling the image of the Italian traditional weaving artisanship, of the encounter between the warp and weft in the textile’s creations.